Sugar gets some terrible press these days due to its relationship with dental health and obesity and so it’s something we should all be trying hard to reduce in the diets of our children (and ourselves). While sometimes it can be pretty obvious that a food is high in sugar and should only be consumed as a special treat, there are other foods that pass themselves off as being everyday kind of foods, while sneakily containing large amounts of added sugar. Many people are surprised by my dislike of fruit juices thinking that they are full of fruit and subsequently must be good for you. While juice may be a good source of vitamin C, my compliments pretty much end there. Whole fruit is jam packed with a range of wonderful nutrients and fibre. Fruit juice is a very concentrated version of fruit (minus the fibre). If you have ever squeezed fresh juice before, you will know how many pieces of fruit it takes to fill up a glass of juice… at least 5 oranges! If you don’t believe me, squeeze some orange juice tomorrow morning and see. Now, if I sat down and ate 5 oranges, I would be incredibly full as they contain large amounts of wonderful fibre. When I drink the juice though, I still have space for my full cooked breakfast and more. By removing the fibre, all your are left with is large amounts of fruit sugar and vitamins. Unlike fruit juices which do contain some vitamins, soft drinks on the other hand, have no nutritional benefits at all (other than maybe providing some hydration if it is not a caffeinated drink). They either contain large amounts of added sugar, or artificial sweeteners, neither of which are good for our kids to consume. Water and milk/milk alternatives are the only two drinks children should be consuming. As a general rule, most cereal boxes with a cartoon character on the front of the packaging should not be given to your children. They often contain large amounts of added sugar and salt. If your child does not like porridge though (and let’s be honest, there are plenty who don’t), you will need to spend a bit of time looking at the information contained on the cereal boxes to make sure you are choosing the best option. When trying to choose a cereal with the least added sugar, it is best to refer to the ingredients list, rather than the Nutrition Information Panel (NIP). While the NIP provides information about the total amount of sugar in the cereal, it does not tell you how much ADDED sugar there is. The total sugar will include those naturally occurring in the grains of the cereal, as well as any dried fruit that might be in there too. Ingredients are always listed in order from most in the product to least (by weight). This means that if sugar (or another name for sugar such as glucose, honey, golden syrup etc) is listed in the top three ingredients of the cereal, then there is likely to be a substantial amount of sugar added to that cereal. The key to reducing added sugar in your children’s main meals is to make as many dishes from fresh ingredients as you can. Ready meals and many bought marinades and sauces are laden with sugar. While this might initially seem overwhelming, you will be amazed at how easy it is to make a sauce for a stir fry or Mexican spice mix from many ingredients you have lying around in your cupboard already. Making a batch of these sauces and storing them in your fridge/freezer/cupboard for next time is a great way to save time too. It is important to send your children to school with a lunchbox filled with wholesome foods to get them through their big day of learning and playing. Try to limit packaged sweet foods such as muesli bars, biscuits and cakes and instead provide them with fresh fruit (which is naturally nice and sweet), pretzels or popcorn and vegetable sticks for a snack. For more information about packing a healthy lunchbox, see our article about packing a healthy lunchbox. After school snacking is often a big event in many households with any witnesses wondering whether the school children have eaten anything for the week prior to getting home! This is probably the time of the day when children are most likely to consume large amounts of foods with added sugar. Try to fill the fridge with containers of chopped up vegetables, or have a well stocked fruit bowl on the bench in the line of sight for the children to grab quickly. Consider setting up ingredients to make homemade smoothies including fruit (fresh or frozen), milk/milk alternative, a handful of natural nuts etc for a wholesome and filling after school snack. Yoghurt is something that many people assume to be a healthy food. While a natural or plain greek yoghurt is a nutritious and filling food, many of the flavoured yoghurts unfortunately have large amounts of sugar added to them. Looking at the NIP on a yoghurt package is even more confusing than other products as yoghurt is made from lactose (milk sugar) and so the total sugar in yoghurt will always appear to be extremely high when compared to other foods. So, as with breakfast cereals, the best way to work out which flavoured yoghurt is a good option is to choose one that does not have sugar listed in the top three ingredients of the product. Alternatively, use a natural or plain greek yoghurt and add frozen berries to the container overnight and let them melt into the yoghurt – delicious and no added sugar. When the weather is hot, there can sometimes be nothing better than an icy pole to help the kids cool down after school. 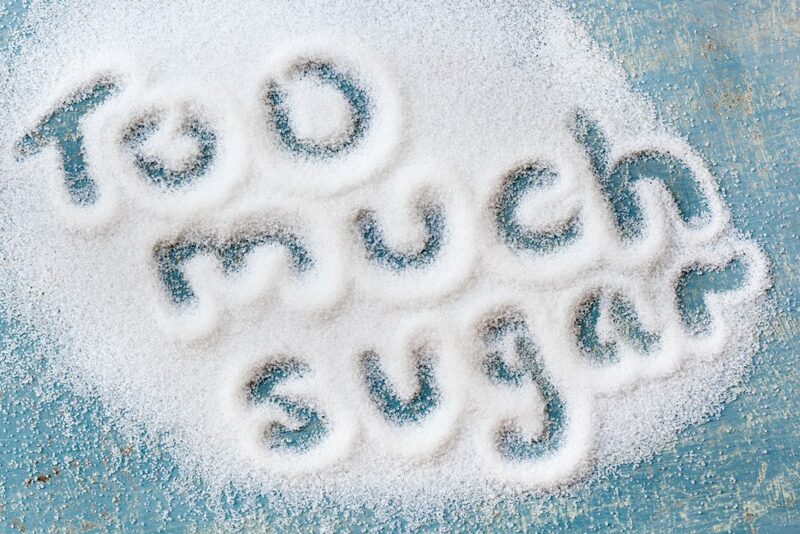 There are a number of different options available on the market which range from 10-20% sugar. These are a treat and should only be given to your children on their designated treat day. If the weather is really hot, consider some homemade icy poles/ice cream/frozen yoghurts to cool your kids down. There are many moulds you can purchase from various homeware stores. You could make up delicious smoothies, the yoghurt and fruit as described above or dilute fruit juice and freeze them into moulds. For more ideas on homemade frozen treats, see our article here. By nature, these items are always high in sugar but when bought from stores, they will almost always have more sugar (and fat) in them than if you were to make them yourself at home. Baking can be a fun weekend activity with the kids and you can make big batches of oat cookies, slices or cakes and freeze them to put in lunchboxes, for an after school snack or for dessert. Recipes will often suggest far more sugar than is necessary and as a rule of thumb, I would always at least halve the amount of sugar suggested – the full amount is never needed.